Celebrate Christmas when it’s cold and you can get cozy. Christmas in July is a time for us to enjoy the elements we miss out on in December. We’re talking about getting cosy by the fire, wearing grandma’s knitted Christmas jumpers (without overheating), eating some hot figgy pudding and enjoying some mulled wine. No matter how much we try, mulled wine just doesn’t go down quite as well when you’re sitting in boardies by the beach. And, If these reasons haven’t got you frantically searching online for your Elf costume, how about you get to celebrate Christmas twice?? Most of us will have a box of decorations hidden away somewhere. The trick is to decide whether you want to be tasteful or tacky and work your way from there. Why not approach Christmas in July with a little ‘tongue in cheek’? If you stay away from anything tacky normally, it might be quite fun to do it now. After all, it’s not actually Christmas so you can push the boundaries! If you’re going for all out tacky and lots of fun. Nothing screams this than a ‘cringe worthy Christmas Jumper competition’. Challenge your friends to find the most hideous Christmas jumper they can find. You can offer a prize or perhaps being crowned the winner until next year will be enough. Christmas traditions are what makes it such a special time of year. 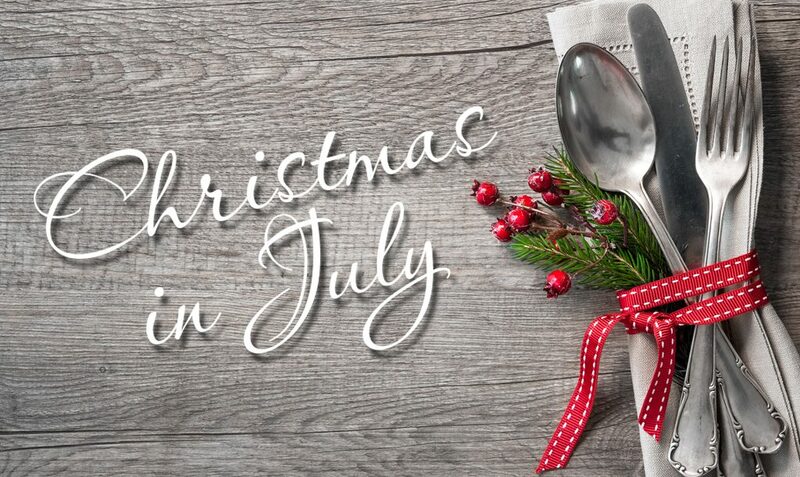 So why should Christmas in July be any different? Of course, nothing sets the tone of a party more than the music. So dig out your old Christmas CDs or put together a special playlist. You’ll actually be listening to songs about snow when it’s cold outside. Now, in our hot climate the traditional Christmas dinner is different from our friends in the Northern Hemisphere. So, why not try and have traditional meal from the colder climates. Roasted meat, chestnut stuffing, pigs in blankets (sausages wrapped in bacon), hot steamy veg and then some good old fashioned ‘figgy pudding and brandy sauce’. Yuuuuuuuuuuuuuum. Bucks Fizz to start, always – no matter where you live or what time of day it is. Mulled wine is lovely and comforting on those cold winter nights. Followed by some warming liquors. Our favourites are Amaretto or Brandy – things with warm, rich flavours for the colder weather.